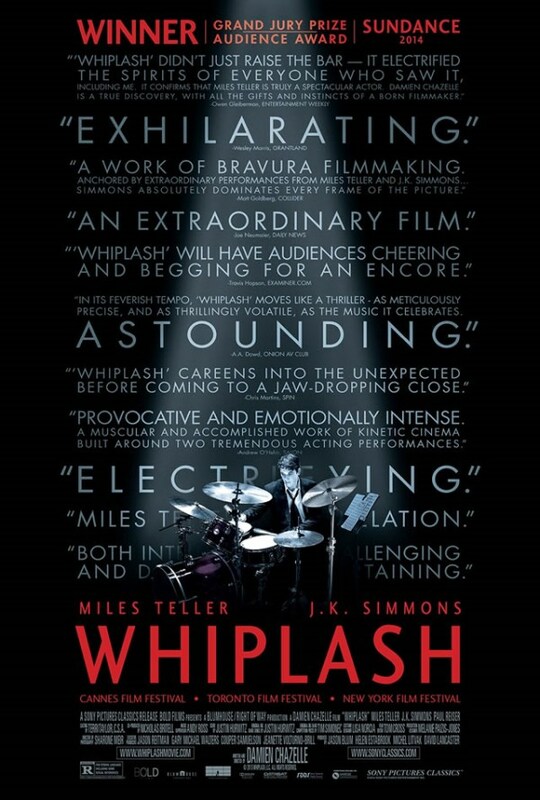 My main problem with “Whiplash” definitely lies in its ending, and the message it entails. This is one of those movies where a young artist suffers mental and physical abuse from his teacher/idol/whatever, but in the end, it’s all worth it, since he prevails and gives the performance of his life – thus condoning the questionable methods of his mentor. In other words: abuse is good, because without it, you’d never be able to reach your full potential. A message that just really makes me want to puke (for a more eloquent elaboration on why this is wrong on so many levels, read my friends kalafudra’s review). I also thought that some scenes were a little too melodramatic and/or clichéd. This is especially true for the car accident. I also found it rather unbelievable that he would rush to the venue afterwards to actually try to play at the concert. Finally: In my opinion, the final drum solo went on too long. After a while I got the impression that it wasn’t just one for the ages, but actually went on for ages. Less would have been more, at least in my very humble opinion. This entry was posted in cinema 2014, movie reviews, Viennale and tagged Damien Chazelle, J.K. Simmons, Miles Teller, Viennale 2014, Whiplash. Bookmark the permalink.